مفاوضات الإختلاف، عرض أدائي حول أشباح أيديولوجية، تتخلل حاضرنا في أوقات التغيرات الجذرية في الخطاب السياسي واللغة. كلاوديا بوسا، وعبد الله ضيف، يؤديان، يتحدثان، يتناقشان، يغنيان، يتحركان ويواجه أحدهما الآخر، في تركيبات فنية مختلفة. ليصبحا ذات وموضوع بحثهما الفني المشترك، فهما مؤديان وشاهدان وأرشيفان لممارستهما الثقافية والفنية. يعتمد هذا العرض الأدائي على بحث فني في النمسا ومصر. وعبر وجهات نظر مختلفة تقوم المخرجة ومصممة الحركة الألمانية كلوديا بوسا، وفنان الأداء والمنتج الفني عبد الله ضيف، بالتفاعل ومسائلة حياتهما اليومية، وبيئتهما المعيشية المختلفة. مفاوضات الاختلاف، عرض أدائي يعتمد على استخدام الصوت والدراما المكانية Spatial Dramaturgy. ويتألف من تراكيب ومواد ومفاوضات وحركة واستخدام وسائط متعددة، في إطار صوتي حي متعدد القنوات، يقدمه جونتر أوير. على مدار ٧ مشاهد يحاول العرض الأدائي صياغة مواقف مختلفة في الفضاء المسرحي وبين الجمهور. مفاوضات الاختلاف، مشروع نسقه ويؤديه كلوديا بوسا وعبد الله ضيف، وهو مفاوضات أدائية حية بالإنجليزية والعربية والألمانية، حول بناء النوع الاجتماعي والأيديولوجيات والقيم الذاتية في مجتمعات مختلفة وبيئات جيوسياسية متنوعة. - هذا العرض بدعم من الصندوق العربي للثقافة والفنون (آفاق)، ضمن فعاليات النسخة السادسة "تجاوز" من ملتقى لازم مسرح. "لازم مسرح" ملتقى مسرحي دولي يُقام في الإسكندرية – مصر، ويُعنى بشكل أساسي بتقديم الإنتاج المسرحي السياسي والاجتماعي/السياسي المعاصر من منطقة الشرق الأوسط وشمال أفريقيا وأوروبا، ذلك الإنتاج الذي تم إبداعه في أعقاب الربيع العربي. ومع عودة ظهور الحركات اليمينية المتطرفة على مستوى العالم، واكتساب الزخم بهدف قوي لنشر الكراهية تجاه الآخر، وإغلاق الدول مرة أخرى على أنفسهم باستخدام الخطاب الفاشي واستخدام القومية والشعبوية، فإن هذه المنصة المؤقتة تكون بمثابة فضاء مفتوح سيتم فيه استجواب ونقد ومواجهة مثل هذا الخطاب. dialogue on difference is a performance about ideological ghosts that permeate our present in times of radical shifts in political discourse and in the language. claudia bosse and abdalla daif perform, speak, discuss, sing, move, comment, confront each other in different media constellations. they become subject and object of their joint research. they are performers, witnesses and archives of their cultural practice. preliminary research in egypt and austria form the basis of this work. from different perspectives the german director and choreographer and the egyptian performance artist and producer are questioning events of the present, their own living environment and that of the other. dialogue on difference is embedded in a sound and spatial dramaturgy and consists of assemblages, objects, dialogues and movements, projections and compositions in a multi-channel setting by composer günther auer. along a score with 7 chapters the performance creates different situations in space within the spectators. 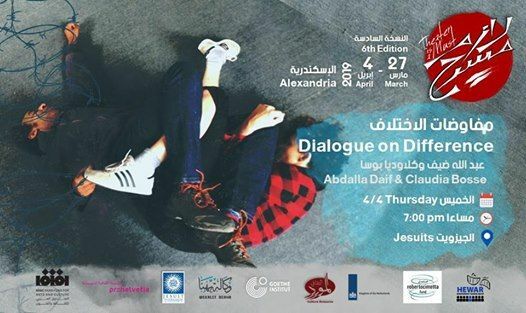 dialogue on difference by and with claudia bosse and abdalla daif is a performative dialogue in englisch, arab and german about the construction of gender, ideologies and subjectivities in different realities and different geopolitical environments. a project by claudia bosse in cooperation with abdalla daif. artistic direction/performance: claudia bosse, abdalla daif; composer: günther auer; assistance vienna: dagmar tröstler, communication: vicky klug, production theatercombinat: alexander matthias kosnopfl; production reflection: ahmed eldeeb. a production by theatercombinat in cooperation with reflection for arts, training & development, alexandria (eg), in coproduction with kosmos theater vienna, supported by wien kultur and change of scene – international partnerships for the performing arts with partners from north africa or eastern europe, a program of robert bosch foundation in cooperation with the german centre of the international theatre institute, by austrian cultural forum cairo, by a research grant for performing arts by the senate department for culture and europe, berlin and by wijhat, an international mobility fund for artists and cultural actors by culture resource (al mawred al thaqafy). kindly supported by goethe institute alexandria, janaklees art space alexandria, hellenic institute alexandria and wekalet behna art space alexandria. Theater Is A Must International Theater forum in Alexandria, Egypt is mainly concerned with presenting contemporary political and socio-political theater productions from the MENA region and Europe created in the wake of the Arab Spring. 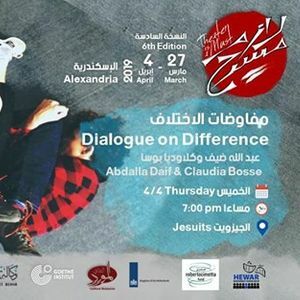 The 6th edition of the forum is themed “Crossing Over, تجاوز” and held from March 27th till April 4th 2019 in Alexandria. This edition focuses on contemporary productions that discuss our contemporary reality of wars, immigration, and refuge with an emphasis on cities, borders, and identities. This edition attempts to explore how we, as global citizens in different contexts, deal with this common reality. What urges us to embrace the other? Does the other threaten our identity? How high are our fences? For whom do we raise them up, or bring them down? As radical right-wing movements are globally re-emerging and gaining momentum with a strong purpose to spread hatred towards the other and to close nations back onto themselves using fascist discourse and utilizing nationalism and populism, this temporary platform serves as an open space where such discourse will be questioned, scrutinized, and countered.